If you have a book-length draft that’s completed or nearly completed and are looking for a group of dedicated peer readers to provide specific deep feedback on the work in order to help you hone, refine, and tighten it for publication, this online independent study Advanced Manuscript Workshop will get it done and have you on your way to having a publishable manuscript. Over the course of the 25-week online workshop, writers will give and receive constructive feedback and critique on a maximum of 300 pages of manuscript, which can be new material or material revised during the course of the workshop. All work happens in a secure online classroom where the peer writers can chat, share information and resources, exchange manuscripts and notes, and engage in conversation about the work 24/7. Additionally, the group meets weekly with a mentor writer who is on hand to provide resources, spot feedback, and make available to the group the opportunity to discuss any outstanding issues with their writing or process. This workshop is an independent study for advanced-level peer writers, with weekly mentor meetings for additional guidance and check-in. The mentor does not read or comment on the manuscripts; however, any participant from the Advanced Manuscript Workshop wishing to receive additional specific one-on-one coaching and editing outside the scope of the workshop may engage a One Lit Place editor at a 20% discounted hourly rate during the workshop and for six months following the workshop. *Rates vary depending on the editor selected, starting at $80/hr. (to which the discount will be applied). 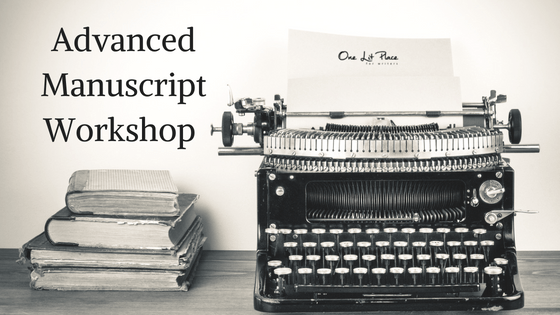 The Advanced Manuscript Workshop meets in a dedicated and secure online classroom where writers meet, chat, and post their work 24/7. Participants receive a schedule and a classroom infrastructure to enable each writer to submit and discuss the work, pose questions, and articulate any concerns about the work’s development. Secure unlimited video chat is available for live conversation and break-out sessions. Each week writers meet over video chat with the group’s mentor to receive spot consultation on pages, ask questions and get support. Additional time may be booked with the mentor or another requested editor for additional manuscript review and editing at a 20% discount (during the workshop and for six months following). Preparing a manuscript for publication can be difficult work; having a smart peer group of readers at hand who are invested in your success and give advice and feedback, brainstorm ideas, and help you see trouble spots and gaps in the plot, characters, and any other areas of your work is extremely valuable to your project and to you as a writer. For further information and to register, please click below.